The uniqueness of the Garifuna Diaspora has resulted in their truly singular cultural anthropology. These are a people who descended from the Arawak and the Caribe peoples, who migrated to the Caribbean and coastal Central America hundreds of years ago; and later intermarried with West Africans—mainly from Nigeria. Their society as it has come to be known today is blossomed into being when the slave-ship “Bight of Biafra” was wrecked near the Atlantic coast of Central America around 1675. Today the Garifuna number only about 600,000 and are spread across and were settled in Belize, Guatemala, Nicaragua, Honduras and the island of Roatán, with a few settled in parts of the United States of America. Their music is a reflection of this unique culture. Today this music is in resurgence due to The Garifuna Collective and, in this largely matrilocal society, with the Garifuna Women’s Project. Both these groups were brought to fruition by the legendary Garifuna musician, Andy Palacio. Mr. Palacio’s seminal songs shaped the music of the Garifuna peoples in much the same way as Woody Guthrie and Robert Johnson did that of the United States of America. Although Mr. Palacio has since passed on, his spirit still inhabits the two groups, who carry on his great work together. They do so with an innovative young musician and producer from Belize, Ivan Duran, who was inspired by Mr. Palacio, and whose meticulous and inventive craftsmanship has resulted in 2008’s Garifuna Women’s Project—Umalali and The Garifuna Collective’s Ayó . The music on both albums sparkles with immense beauty. The latter especially is the latest in the series and has all the qualities of a great work of art. Ayó is at once elementally melancholic and joyful. Its songs resurrect the experiences that recall the crying sky, the wretchedness of poverty, undying bonds and the whispering of goodbyes. This is a society where community triumphs over loneliness. These are a people who rejoice in the purity of friendship to love and a view of the immensity of the world outside. The songs are sung in a language that has been kept alive by this culture with a vibrant oral griot tradition. Each tells a simple story of a people who survived colonisation and turbulence and have lived to tell the tale in a language that is a sonorous and radiant mix of Arawak and Caribe with a smattering of English, French and Spanish. The Garifuna language is uniquely percussive and the music too is reflection of this percussive sound as it centres round the polyrhythms arising from the Primero or tenor drum and the segunda or bass drum. (Other drums include those made of gourds and even turtle shells). One unique aspect of the language and the lyrics of the songs is that they use terms used almost exclusively by men and terms used exclusively by women. This is beautifully explicit in charts sung by the celebrated Lloyd Augustine and Desiree Diego. This music is almost always voices by more than one lead singer. In this regard it bears uncanny resemblance to the call and response of the blues. In songs such as “Galuma” sung by Lloyd Augustine and in “Mongulu” which is voiced by Ms. Diego the music soars heavenward as the stellar vocalists unleash the great vocalastic power that stirs from deep within the belly of their souls. The music also resembles the music of jazz in that it more often than not breaks—with the sound of surprise—like a tremulous dawn, secret and unseen. Another unique aspect of this music is the fact that its lead singers are backed by a choir of background vocalists. It is as if the whole community participates in a vocalastic celebration. This sharing of joy is beautifully explicit in “Thanks To You”. As much as there is joy there, there is much sadness in “Ayó” and “Gudemei”; There is deep longing in “The World” and in “Listen” and historicity in “Ubóu,” “Mongulu,” “Pomona” and in “Alagan”. With multiple performers from vocalists interwoven into a glorious fabric of drummers and stringed instruments (guitars and basses) the music has a rich sonority and a wonderful texture that harks back to glorious choral aspect that is unique in all the world of music and harks back to the early days of Roman and Gallic music that is channelled through a certain Joycean stream of consciousness. All this is, of course, worked into a culture so unique that the music is like nothing else in the world. This album is a continuation of the great work begun by pioneering Garifuna musician Andy Palacio in Wátina and in the Ivan Duran production Umalali. Track Listing: Ayó (Goodbye); Galuma (Calm); Kame Báwara (Why You Call? ); Ubóu (The World); Mongulu; Pomona; Beíba Nuwari (Go Away); Gudemei (Poverty); Dungua (Meet); Aganba (Listen); Alagan (Legacy); Seremei Buguya (Thanks To You). Personnel: Lloyd Augustine: lead vocals (1, 2, 4, 6, 8 – 12), background vocals (1 – 7, 9 – 12), electric guitar (1), acoustic guitar (6); Justo Miranda: lead vocals (12); Aurelio Martinez: lead vocals (12); Desiree Diego: lead vocals (5, 11), maracas (10, 11), clave (10), background vocals; Sheldon Petillo: lead vocals (3), background vocals; Mohobub Flores: lead vocals (3, 5), background vocals; Lugua Centeno: lead vocals (4, 8, 10), background vocals (3, 12); Chela Torres: lead vocals (3, 5, 7), background vocals (5, 6, 8); Rolando “Chichiman” Sosa: lead vocals (6); Joshua Arana: lead vocals (9), Garifuna primero drum, Garifuna segunda drum (10), background vocals (4, 5, 6, 9, 10); Denmark Flores: Garifuna segunda drum (1 – 8, 11); Giovanni Chi: lead vocals (9), Garifuna segunda drum (2, 9), maracas; Rolando Sosa: maracas (3); Drew Gonsalves: cuatro (1, 2, 4 – 8, 10, 11), electric guitar (2, 12), bottle (2), acoustic guitar (3, 4, 7, 8); Guayo Cedeño: lead guitar; Sam Harris: lead guitar (1, 6, 8, 9, 10), electric guitar (5, 11); Nuru Dyaan Ellis: electric guitar (1, 3); Ivan Duran: bass (1 – 4, 6, 7, 10, 12), bass guitar (11), and electric guitar (1 – 10, 12)acoustic guitar (2, 5, 7 – 9); Al Ovando: electric guitar (4 – 9, 11, 12), Maya guitar(1 – 3, 5 – 9, 11, 12), acoustic guitar (9), banjolin (3), turtle shells (2, 3), jawbone 3, 5, 6, 8, 9, 10, 12), bass (5, 10); Danny Michel: bass (4), Rhodes piano, 6, 8), cowbell (6); Garifuna Collective: hand claps. 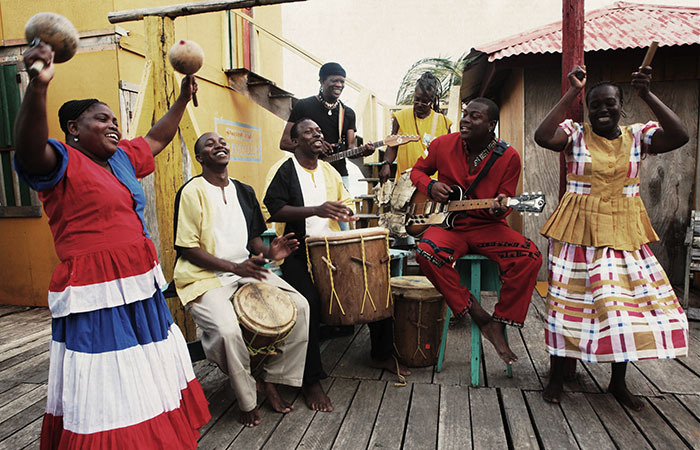 Andy Palacio & The Garifuna Collective’s 2007 album, Wátina is one of the most praised world music albums ever released. On the cusp of tremendous fame, Andy passed away suddenly a year after Wátina was released, leaving the world to wonder just how big he could have become. His band has continued where Andy left off, and with Wátina producer Ivan Duran back at the helm, have produced a soul-stirring collection of songs inspired by their unique Afro-Amerindian cultural heritage. 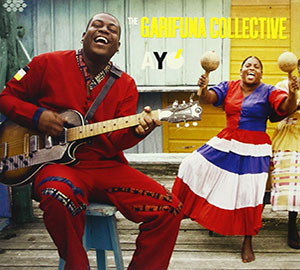 With a lineup that consists of the best musicians in the fertile Garifuna music scene, The Garifuna Collective promises to carry the torch of cultural preservation and promotion passed on by Andy Palacio far into the future.